My neighbor came over the other day and we stamped while the kids were in school. We had a great time. She cased my lobster card only I was out of real red paper and waiting for my order to come. Of course Brown came as soon as she got the card done. Go figure ha? Anyway, she used brocade blue, white and black. It looked super cool. Then she decided to make a graduation card with the same colors. It was awesome. So I decided to case her case of my case. LOL I don't know anyone graduating but if I need a card for a girl I've got one. Don't cha love these colors together? I love using black cause it just makes the other colors pop. 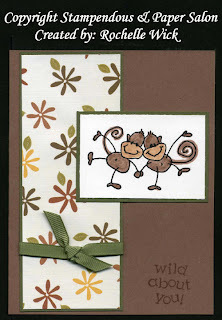 I made a cute card yesterday but I didn't get it finished to post it today... so today you get monkey's. I don't know who makes this paper but it goes pretty well with the monkey's. I really like the earth tone colors a lot but seem to always go for the brights. The wild about you greeting is from paper salon. It came with a bunch of animal stamps. I haven't made any cards with that set yet but I have used the greeting several times. I hope you all have a great weekend. We are just hanging out and I am gonna stamp! 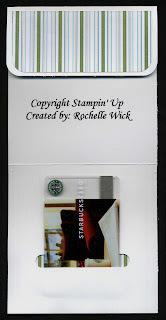 My good friend Nancy Hill posted a gift card holder the other day in a yahoo group that we are both in. (waving hi to Nancy!) I fell in love with it so of course I had to make one too. Ok, I had to make 6. LOL This one is kinda blah but the other ones I made I used colored cardstock. 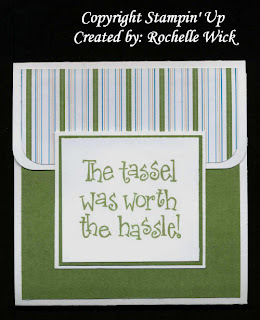 They are super easy and a perfect card/gift card holder for graduates. I don't know anyone graduating this year but they work just as well for birthday's, pick me up cards, or teacher gifts. The possibilities are endless. This is the inside of the gift card holder. There is a big space for you to stamp a greeting or write one. The dimensions for these are 10 3/4 x 4 1/4 then score at 4 1/4 and 8 3/4. Then you round the corners on the small flap. Cut two pieces of pattern paper for the front of the card. The small piece is 1 3/4 x 4 and the big one is 4 x 4. Round the corners of the small piece. Take your word window punch and punch a "slot" for the gift card. I punched the first one off center and then punched the other one to the other side so that it made one big one in the middle to fit the gift card. (Hope that makes sense) Then I glued the small piece of pattern paper on the top flap. When you glue the bottom 4 x 4 piece, ONLY put adhesive in the four corners. You don't want to glue over the word window otherwise you can't get the gift card in. If you look under the gift card, you can see the pattern paper. The reverse side is on the front of the card. For the stamped image, you ONLY want to adhere the bottom of it to the front of the card. That way you can tuck the flap under the stamped image to keep it closed. Clear as mud? LOL If you don't understand what the heck I am talking about, here is a link to Dawn Griffith's blog and she has a video tutorial on how to make these. Be warned, they are addictive! "Belli Challenge #19- Gel Pens"
I saw these the other day on Patty Bennett's blog. Are they cute or what? Yes, they are. How fun it was to make a bunch of these up. I am going to do some more and package them up as sets. They make great summer birthday cards or invites to birthday's or BBQ's. I was going to make them for my up coming class at the parks and rec but my scallop punch wasn't cooperating with me punching through two pieces of cardstock. I talked to Patty and she said that she punched one corner first and then lined up the other side and punched the back out so they matched up. Brilliant! LOL So if you are making these, that is a tip. You guys are always lucky with my directions. Cause you get to learn from my mistakes and do it right the first time with no frustrations. Ha ha ha. For the grapes, I used a hand held circle punch and punched out 10 circles, glued them down in a triangle shape, and then punched them out with the SU 1 1/4 inch punch. That way they were perfectly in the circle. For the leaf I just eye balled it and cut it out. 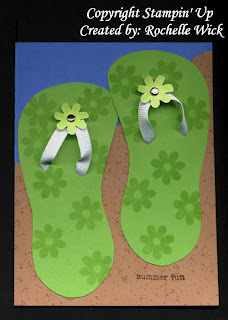 The greeting is from Birthday Whimsy but is is hard to see in the picture cause it is the same color as the cardstock. On the inside from the same set it says ...and many more. 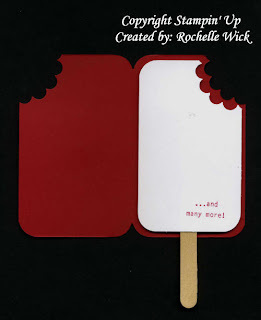 Patty used a rectangle ribbon punch to weave the Popsicle stick through, I just glued mine down so that the completed card measures 5 1/2 tall and will fit in a A2 envelope. The inside white piece is popped up with dimensionals. I hope you all had fun last week. I know I sure did. I used a random number generator to pick the winners. Which was the easy part. The hard part was counting the comments to find the names. But I counted them twice to make sure and here are the winners of the blog candy. Cyndi was the winner of the Stickles! Congratulations ladies. Shoot me an e-mail with your address so I can send out your goodies. 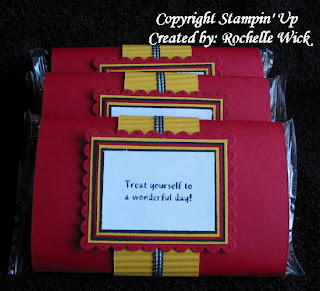 You would think that I would have been stamping all week since I didn't really post anything other than blog candy. But I didn't. I don't have anything new that I made except for this card that I made for a swap that I am in. I hope they like it. Today is a crappy rainy day in Sacramento so I am going to stamp all day. Well, most of the day. I do think the kids might want to eat sometime today. 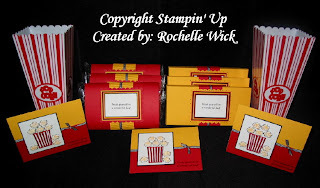 I have a bunch of stamped images to do and I really need to prep for my up coming class. It is going to be last minute this time though cause my paper order comes in next week and it is mostly for my class. If you haven't entered to win the blog candy you still have time. I am drawing the winner on Sunday at midnight my time. Hope you all have a nice and safe holiday weekend. "Blog Candy~ Giveaway #5 Grand Prize"
Can you believe it's Friday all ready? Man, this week went fast. As you know I am a resident instructor for the Scor-Pal. I truly love this product. This week I am giving away all the things that I love and the Scor-Pal is defiantly one of those products. I contacted Diana Crick, the creator of the Scor-Pal, and told her that I wanted to give away a Scor-Pal as blog candy for my 200,000 blog hit milestone and if I could order it with the winners name and she could send it to them. Diana not only said that she would send it to the winner, she also said that she would love to donate the Scor-Pal to the winner!! How cool is that! I know, I was so thrilled when she told me. She is a remarkable lady and so very generous. She congratulated me on my milestone and told me to let her know who the winner is and she will send them out a Scor-Pal right away. Thank you Diana for your generous gift, it means a lot to me. You Rock!! This has been a fantastic week for me and I hope for you as well. I really have had a good time with the giveaways. I just wanted to take a minute to say thank you to all of you. Thank you for all your comments, for visiting my blog, being my friend, and for being an important part of my life. I feel like I know you all a little more and you know me better as well. I have been blogging for almost two years now and it has been one of the best experience I have had. Over 200,000 hits is huge for me and I owe it all to you. So thank you from the bottom of my heart. For a chance to win this SUPER COOL grand prize, leave me a comment. You can say anything. I just want to hear from you. And once again, thank you for all of your support. The deadline for wining this fantastic blog candy is Sunday May 25th. I will draw all the names Sunday at midnight my time and announce the winners on Monday May 26th. Please feel free to enter to win all of the blog candy that is being offered this week. You can win more than once. You have to enter each one though. One entry doesn't enter you in all of the giveaways. I seriously can't tell you all how fun this is. I enjoy reading all of your comments so much. I feel like I know you all so much better. I wish I could do this every day. (I'm sure you do too LOL) I love hearing about you guys. I am compiling some lists of things from the posts the past three days which I will post later. Some of you are very funny. I like that cause I am funny too and I love to laugh. You guys make me laugh. I can't wait until tomorrow!! Do you know why? Well, it's the grand prize giveaway!!! Do you think you know what it is? 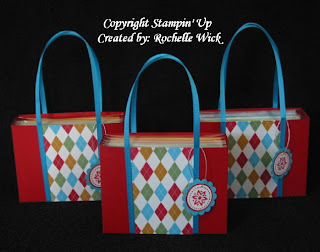 To win these fabulous stamps leave me a comment telling me your favorite stamps. Either a set or a single stamp, current or retired, any company. 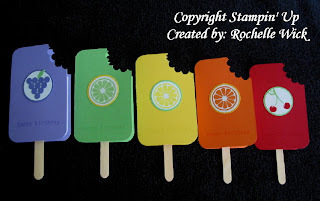 I would like to get an idea of what you guys like so I can make projects with the stamps you have to give you ideas. Ya know, providing I have them. LOL Ok, I am talking too much now and this post is entirely too long. Have a great day everyone! Look what I got in the mail yesterday! Hand made dish towels!! How cool is that? I got them from Christa H. Her and her friend Winona look at my blog all the time and recreate some of the cards I make. I sent her and Winona some stamped images that they didn't have so they could make more cards and she sent me these cool dish towels that she knitted. Thank you Christa. I love them. Now a funny husband story. You all know how the husbands are, they just don't get it. I tell him about my blog hits and read him some of the comments, and I am always talking about my "friends" all over the world and he just rolls his eyes. So when I got Christa's package yesterday in the mail, he was like. "Hey Rochelle, you got mail from one of your stalkers"! LOL He did say it with a smile so I know he was kidding. Men, they just don't get it! Woo Hoo!!! Were you all going nuts waiting for me to post the next blog candy for the week? I was too cause I wasn't sure which one I was going to do today so while I was deciding I ran some errands. Today I am giving away 2 of the new embossing folders. Floral Fantasy and Distressed Stripes. 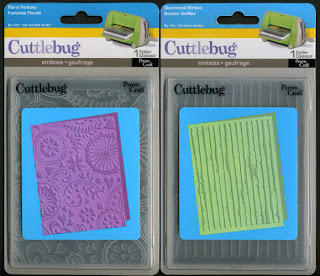 If you don't have a Cuttlebug but you do have a Sizzix you can use that to emboss. 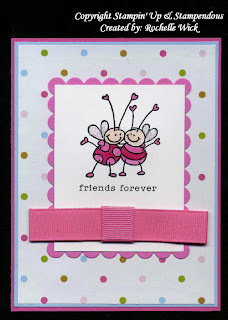 I just recently got the Cuttlebug but before that I used my Sizzix. 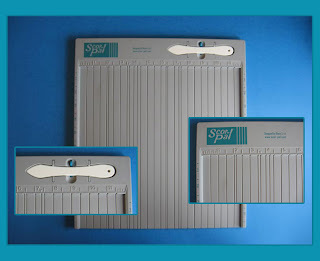 You have to get the converter kit for the Sizzix though before you can emboss. They cost around $14. You can get them at Michael's or Joanns or try your local stamp store. That is where I found mine. The converter kit is a magnet that adds height to the part that comes down on the dies. My friend Kristine did a tutorial on how it works. You can find it here. What is the Belli Challenge you ask? Belli = Embellishments. This weeks challenge is paper piercing. I came up with this one last minute. I really like the colors and how the over all card turned out. My friend Chris hosts a weekly embellishment challenge. To read more about it you can go here. I used my last piece of turquoise paper for this card so I have to get some more since I still have two packs of East Coast Prep DP and I love love love the colors in it. Check it out. 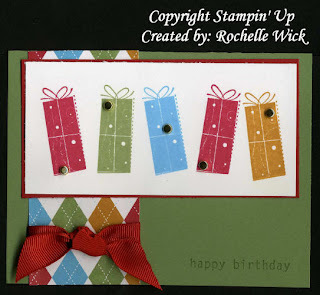 For the "scalloped edge" I punched small circles using the SU 1/2 inch circle punch (the one that is the same size as the little pieces stamps) and glued them on the back of the paper so when you turn it around it looks like a scalloped edge. Clever ha? 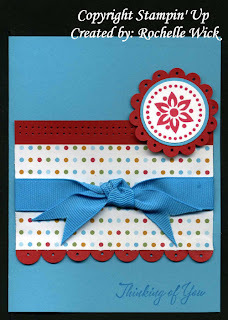 Accessories: Paper Piercer, Mat Pack, Dimensionals, SU Scallop Punch, SU Circle Punches, Turquoise 5/8 inch Grosgrain Ribbon. Holy crap!! We did decide that I can say that on a blog right? LOL I am so excited right now. You all had such nice things to say to me and about me and my crafting. It brought a tear to my eye. I feel truly blessed to have "friends" like you all. Even if I don't know anyone personally. I hope you are all having fun with the giveaways. I know I am. You are all gonna die when you see what I am giving away on Friday. It is BIG so you definitely want to sign up to win that one. Not that the other ones aren't cool but Friday's is HUGE!!! Ok, enough about that. On to today's giveaway. 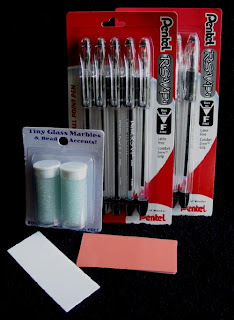 I am giving away the supplies needed to make beaded pens. (along with printed directions in case you don't know how to make them). You will be getting 10 pens, one pack of microbeads (which is enough to make almost 20 pens) 12 address labels pre cut to size, and 12 pieces of tacky tape also cut to size. The only thing you need to provide is stamps, a heat gun, and container to roll the pens in. (you can use an empty stamp case for that) AND since I am in a giving mood. I am going to pick 2 winners for this one! Woo Hoo!!! 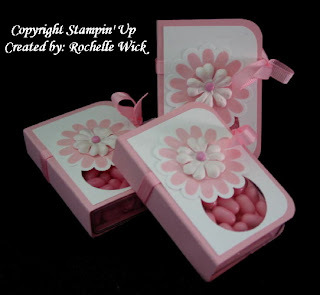 So to register to win this blog candy, leave me a comment on this post telling me what your favorite crafting item is. What can you not live without. 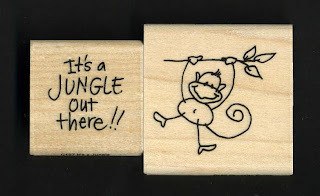 For me, as you know, it is the Stamp-A-Ma-Jig. I use it every time I stamp. My blog hit over 200,000 hits over Mother's Day weekend. That is crazy!! It is almost at 210,000 now. I can't believe it. So to thank all you for visiting my little spot on the Internet, I am going to offer blog candy ALL WEEK!!! Yes, all week! Today's giveaway is a rainbow of stickles. You will get 8 bottles of all the fun rainbow colors. I thought that I would give away things that I love and stickles are on the top of the list. Since I will be giving away things all week the dead line to win is going to be Sunday May 25th. I will draw all the names Sunday at midnight my time and announce the winners on Monday May 26th. Please feel free to enter to win all of the blog candy that is being offered. You can win more than once. You have to enter each one though. One entry doesn't enter you in all of the giveaways. To enter to win, please leave a comment on this post telling me, if you are a subscriber (either FeedBlitz or Google Reader), what part of the world are you from, and what keeps you coming back to my blog. I will ship to US and Canada if you are the winner. Sorry, I can't ship overseas. Thank you again for visiting and good luck! Another giveaway tomorrow!! 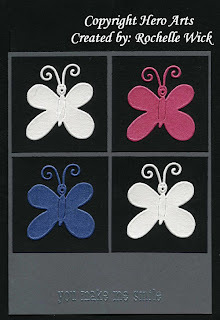 "RAK From Lynn in St. Louis"
I got this very very pretty card in the mail the other day from Lynn Mercurio! I have no idea what stamp set this is but it is super cute. Thanks Lynn for thinking of me. Check out Lynns blog here. She is very talented. 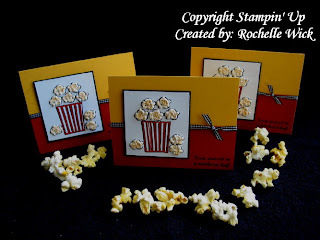 Here is the completed popcorn gift set for the teachers. They are getting wrapped microwave popcorn, wrapped Mike and Ike's candy, and I am also going to get them movie tickets. I really really like how this all came together. I found the popcorn containers at the $1 at Target last year and I bought a bunch of them. I knew they would come in handy. The greeting on the candy, popcorn and the card all say "Treat yourself to a wonderful day"
For the Mike and Ike's I made a box out of one sheet of cardstock to cover the candy in. I think it looks cool. The red wrap around is crimped and I added some black dots with a marker to add a little extra around the scallops. It's hard to see but there are black dots in the red scallops on the wrapped microwave popcorn too. This was a fun set to make. I know the teachers will like it. I was trying to think of what to make for the teachers for a end of school gift. I came up with a few cool things. 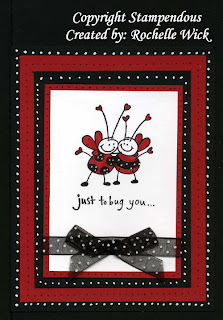 This is the card that is going to go with the gift set. I can't wait to show you the whole thing. I haven't used this stamp set in forever, I actually had to dust it off. My bad. Anyway, I stamped the popcorn in the bag and some that spilled over, covered them with liquid applique and heated them up and they poofed! I went over them with the summer sun marker to give them that yellow/white popcorn color. They turned out super cute. I used the stamp-a-ma-jig to line up all the pieces of popcorn cause I am no good at lining things up. If you haevn't tried liquid applique it is so fun. I like to use it for popcorn and snow. It just adds the perfect touch to your projects. So I thought I would make "a" birthday card, as I started to make it, I decided I might as well make three of the same so I could have some on hand. Then I made three more in a different color, and three more in another color. Then I went crazy. I made 6 different colors, 18 cards total. Has that ever happened to you? I know it has. The greetings are all popped up on dimensionals. It was fun making all the cards. But what am I going to do with them all? I decided to make totes for them and give them to the girls teachers. The tote is the paper crafts tote. You can find the pattern here. 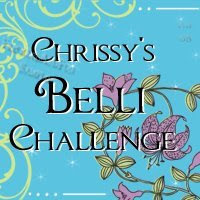 "Belli Challenge #17- Die Cuts"
What is the Belli Challenge you ask? Belli = Embellishments. My friend Chris hosts this challenge every week. This is my first time participating. This weeks challenge is Die Cuts. Here is where you can go to get more info. For this card I decided to use nestibilities. I don't have any but my friend Kristine cut some out for me. I am seriously thinking about getting some. I really like them. I also paper pieced this Bella's outfit. 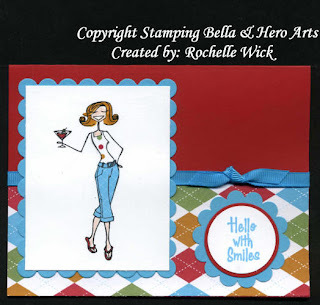 I stamped her on the polka dot paper for her shirt and then again on the reverse side for her pants, then cut them both out and glued them on the stamped image. Instant outfit! I decided to to two cards for this challenge. I don't know the colors of the butterflies. My friend Shelly sent them to me like forever ago. I totally forgot that I had them. They are all on shimmer paper though which is super cool. I embossed the greeting from Hero Arts cause I thought it matched the gray paper better than if I inked the greeting on the paper or made the greeting and matted it on the card. So, how is everyone today? I'm good. Sarah is still sick. Fever of 101 so she is staying home again today. Poor girl. She wants to go to school so bad. She just loves school. It is real hard to keep her home even when she is sick. I made this card the other day. Kinda different ha? Seriously, the pinks do match, the scan just made them look different. I used the Scor-Pal to make the three scor lines on the left of the card. Then I put the rest of the card front in the cuttlebug. I really love this swiss dots folder. I think it is my new favorite one. I can't remember the last time I made a white card either. I really like the pink and white together. It looks somewhat elegant don't-cha think? The greeting is a clear stamp that I have. I don't remember who makes it. Hope you all have a great day. 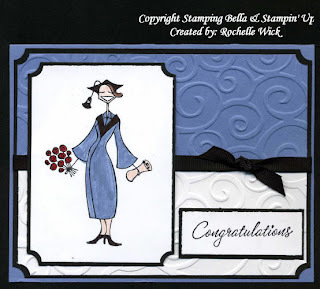 I made this card with my new stampendous stamp. Are these bees cute or what? I colored them with markers and added some stickles on the wings. The greeting is a retired hostess set. So many sayings. I thought it was perfect for the bees. I have two kids home sick today and my husband went out of town for work. AGH!! Something is going around at school. When my daughters teacher called to send her home, she said that she has 6 kids out already today and Sarah makes 7. So I put her in my room with the tv and a bottle of water. Maybe I will get to stamp since everyone will be resting. I hope you all had a great Mother's Day. I sure did. Tony takes the girls out every Mother's Day so I can have some alone time. This year they went to the park, out to lunch, to a movie, and back to the park. I stamped my little heart out while they were gone. We grilled burgers on the grill for dinner. (which is my FAVORITE food evea!) So Mother's Day was good to me. I hope it was good for all you mothers out there as well. This is one of the cards I made. It's pretty simple but I really like it. I don't know who makes the paper, I always cut off the strip and forget to write it down. The ribbon is some that I got at the Fabric Barn when I was in LA. I sponged some chocolate chip around the white paper and finished it off with three brown brads. Don't-cha think this color combo is perfect for a guy card? 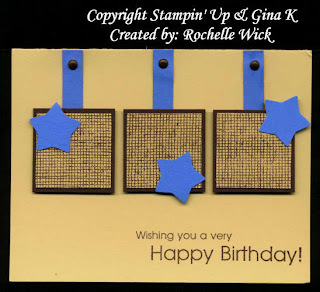 The stars are Creative Memories punches and the blue strips are word window punches with the round part cut off. I found some brown brads that I totally forgot that I had that match the chocolate chip paper perfectly too. The greeting is from Gina K's Make A Wish set. I also put the squares on dimensionals to give it some height. Today at school they had Mom's and Muffins. Sarah's class (1st grade) had a program and they sang several songs, read poems, and then they each got to say why they love their mom. It was super cute. After the program we got to sit with our kids and have muffins. Of course I had several tears in my eyes. I'm such a dork. Dad's and doughnuts is in June. That should be fun for the dads. How cute is this? I am going to do this card for my parks and rec class in June. It just screams summer. The "sandy beach" is torn paper. I don't have a template for the flip flop so what you can do if you want to make one is click on the picture and print it out then cut out the flip flop as your template. 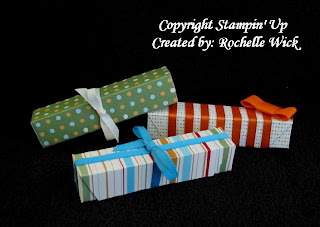 I used the rectangle hand punch for the holes for the ribbon. I cut two 2 3/4 inch pieces of ribbon and put one in one bottom hole and then in the top hole, then do the same for the other side. So there will be two pieces through the top hole. I taped the extra ribbon to the back of the flip flop. The cut out flower is adhered with a dimensional and it covers up the hole where the two ribbons meet. Easy peasy lemon squeezy. I made these two card kits for a friend of mine the other day. She doesn't have these stamps so I know she will love it. 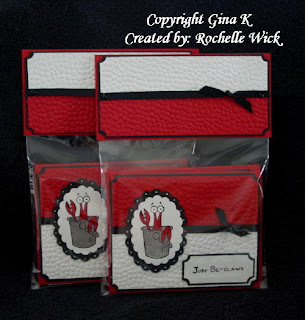 Each kit has one sample of the completed card and the supplies to make two cards inside. This card is one of my favorites so I thought it was a good one to start with. I'm in the process of making a few more kits like this. They are fun to make. "I'ts Never Too Early To Think About The 4th Of July"
At least that is what my friend Margaret says. 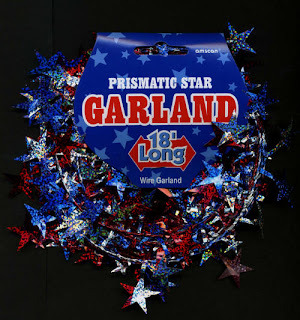 LOL If you are out and about this weekend and happen to see some of this garland you should pick a pack up. I have a fun 4th of July project to show you next month. You should also get some red, white, and blue pattern paper and some packs of lifesavers. With out giving the whole project away, I also got some red tin buckets from the $1 spot at Target to put all the fun stuff in. I found the garland at Party America. They have all there summer stuff out right now so I bought it right away so I wouldn't be looking for it next month. Happy Shopping! I found these pink tic tacs the other day at Walmart. They come in the big pack too so I can use the same dimensions as the snowman kisses that I made for Christmas. Here is where you can get the directions. The flavor of these pretty pink tic tacs is pink grapefruit. Weird! I haven't tried them yet but I really liked the color and how this project turned out. 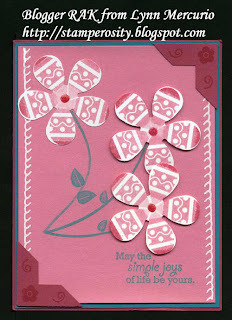 The CM circle that I cut out is under the prima flower, it covers up the words on the scallop stamp. I'm sorry, I had to go back to the black background. It was really bothering me. I hope you all don't mind. I know some of you like the white better but I just can't get used to it. I like how my pictures pop so much more on the black. 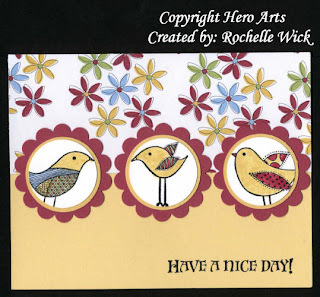 The bird stamps on this card are the mini "Ugly Birds" from Hero Arts. I like this layout but it was hard for me to figure out what stamp to use. I decided on the birds cause I haven't used them in a while and they are kinda cute. The greeting is also from Hero Arts. We had a relaxing weekend. So relaxing that I didn't even stamp. What's with that? Yeah, I know. Crazy ha? Oh well. I almost didn't want to post this. It was supposed to be way cooler than they turned out. I am not 100% happy with this project. I was inspired forever ago by something similar I had seen on SCS. Here is where you can find the crayon box template. I used the 16 crayon size box. It should hold 4 pretzel crayons. However mine only holds 3. I will tell you why. I dipped my pretzels one too many times. I didn't realize it until I tried to wrap the wrappers around them and they almost didn't fit. So they were too thick to fit in the box. If you are going to do this, you should only have one layer of melted chocolate. I used the Wilton Melts. They come in a lot of different colors. You just melt them in the microwave. It's cute don't get me wrong and the teachers will love it, I just don't think it is my best project. If I make them again, I would use cheap cardstock. SU cardstock is a little thick and doesn't wrap well with out getting creases. If you would like the template for the crayon wrapper contact Jenn over Here. She was kind enough to make the template and share it with me. check out her blog too while you are there. She is one talented lady!! Ok, my cool project that I was going to show you today still needs work. I thought it was going to be easier than it was. Who knows, maybe it is easy but I just made it hard. I don't know, I am going to work on it today and hopefully I can get it done and show you tomorrow. This cute little box was Kristine's make and take that we did in our hotel in LA for stamp mania. We were all supposed to bring a make and take for us four to make. Turns out that Kristine's was the only one we did. She had us make this little box and it fits three bath fizzies perfectly. I just saw these bath fizzies at Michael's yesterday in the $1 section so go out and get yours today so you can make this and give it to your friend, neighbor, daughter, kids teacher, or who ever. 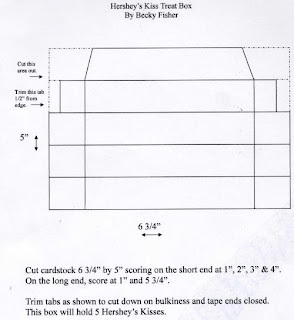 Cut cardstock 5 1/4 x 5 1/4 score on both sides at 3 3/4 and 1 1/2 cut the flaps and make it into a box. Decorate how you like. I was blurffing the other day and came across some cute little boxes that hold 5 Hershey Kisses. (Blurffing is Blog Surfing) Anyway, I thought they were something cute that the girls can give to their teachers for Teacher Appreciation. Super easy to make too. I am making the teachers something else cool. If they work out I will post them tomorrow so keep your fingers crossed cause they are really cool. I didn't save the link to her blog like a dork but her name is on the template so I can give her props that way. 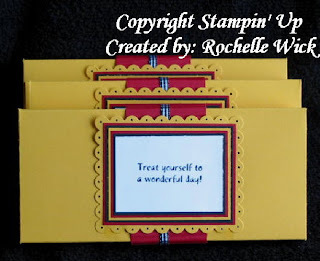 No stamping was involved on these but you could use colored cardstock and stamp on them and make a tag and they would be cute too.